The first day of Spring was Sunday and I’ve been bit by the spring cleaning bug….actually, I was bit a few weeks ago when we had a few days of 50 degree weather. The sun was shining, a nice spring breeze trickled through the windows, which had been begging to be opened for months, and I walked over to relax for a minute on my 4 year old cream leather couch…and noticed it’s not so cream anymore. Want to see? The right side is cleaned, the left is before. Yikes! Less than a year ago, I paid $175 to have it cleaned, the last time we had the carpets cleaned by a “green” company. When the guy simply pulled out a rag and a horrible, strong smelling chemical, I was horrified. Not what I was expecting, it wasn’t as clean as I had hoped, and my couch seemed like it got super dirty really quickly after. 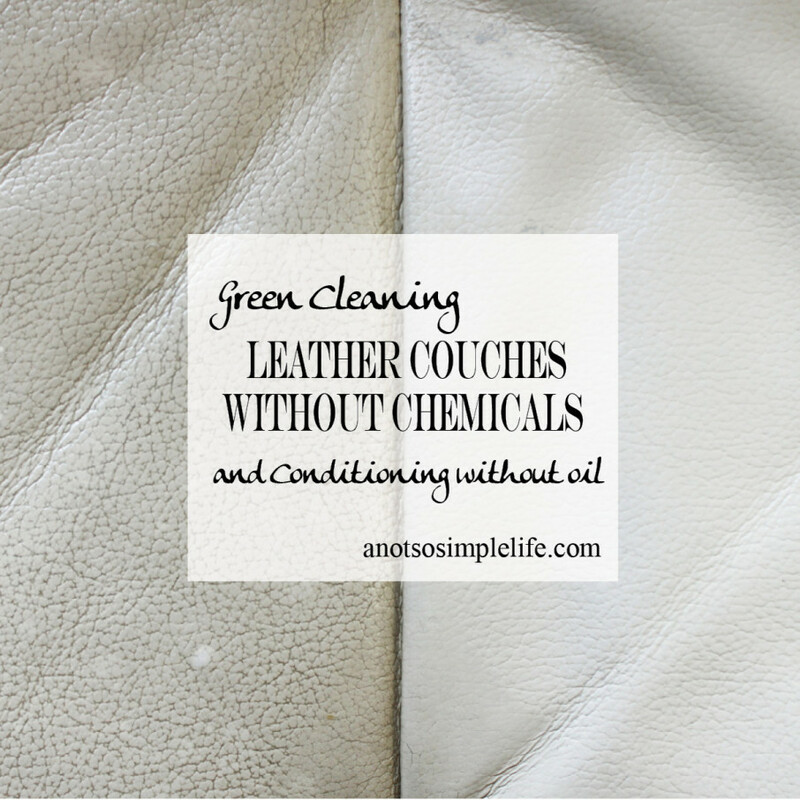 This year, I decided I was going to green clean my leather couch myself, so I started to research…. (which btw paid off because my mom came over a few days later and I told her I cleaned the couch and she said that she noticed, and it was so bright it was “glowing”). The weird thing, there isn’t a lot on green cleaning leather, cleaning leather without harsh chemicals, or green conditioning leather couches. So I had to improvise and trust a few forums and my gut! Want to see the results? Wow right? Ok, please take a look at this picture, this was taken after I had only cleaned the chaise portion of the couch. My couch looks almost new! 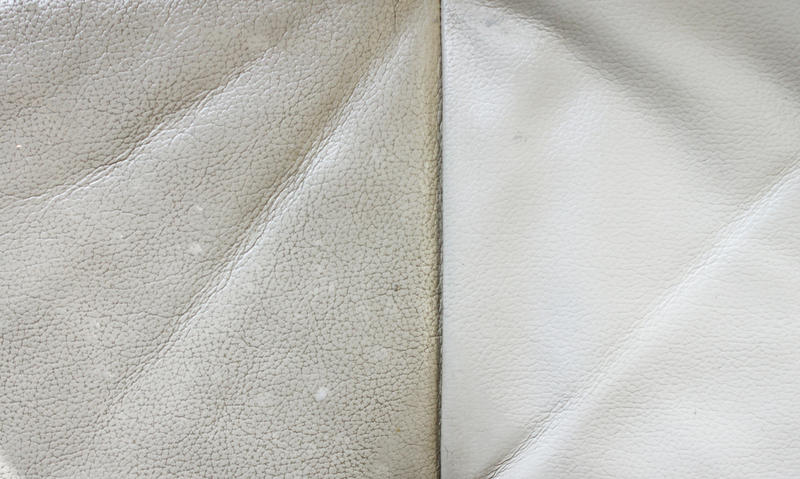 Before you start to clean your leather you need to determine if you can clean it without ruining it by testing, on a inconspicuous spot, a major determinant will be if the leather is sealed or not. Also, this is a good place to note that I am not responsible for your leather goods. I used this technique to clean and condition my furniture and love it but it may not work on all types of leather. This is definitely not recommended for use on any suede or nu-buck leather. These are leathers that are feathered or velvety to the touch, they have no or a very dull sheen to them. My leather furniture is aniline leather, which means it was dyed and then coated with a waxy coating. It’s smooth and shiny so it won’t soak up everything you put on it right away. This site here, shows how your leather should react when something wet gets on it if it’s sealed, and if it’s not. Mine is sealed so I’m comfortable getting it slightly wet, for a VERY short period of time. I did a fair amount of research on how to green clean and condition leather and the majority of the “recipes” called for the use of olive oil combined with other ingredients. Well, I did my research on using olive oil and found that some people across the internet warn against using oil it, even if it’s aniline because it will soak in and then resurface later as oily spots. I’m not willing to take that risk. There were also tons of blog posts of people using olive oil who said “I love it” but, in my opinion, they ruined their stuff. Leather that isn’t waxed or sealed looks like, well, leather covered in oil or stained darker. Actually, when I looked at the pictures, I realized that must have used oil on something leather at one point in my life because I cringed and, slightly but not fully, remembered. So, I decided NO oil, I’m not willing to risk oily spots. I had also read good things about both mink oil and neets foot oil for conditioning, apparently there’s a difference between animal oils and vegetable oils and their use on what once was animal skin (makes sense right?) but I have some moral qualms about mink oil and the reviews on neets foot oil said that it smells terrible. And I could honestly see my dog gnawing at the couch after. No thanks! Finally, I researched retail cleaners like honey leather cleaner. While some of the reviews said it’s great, I wasn’t satisfied with this either, mainly because there were negative reviews about the smell, about the time that the furniture has to sit after cleaning/conditioning, and negative reviews about it being sticky. That can’t work. Dr. Bronner’s products, contain cleansing and moisturizing ingredients made only from certified organic oils, made without any use of petrochemicals, and contain no petrochemical preservatives. The part of that statement that is the most important to me is the fact that it is made without the use of petrochemicals as that seems to be what I see used the most in green cleaners. It’s important to understand that there are a lot of so called “green” companies who use deceptive labeling practices that interfere with our ability to determine if their products main ingredients are in fact made with certified organic, not conventional or petrochemical, material, and free of synthetic preservatives. One place you can turn if you want information on a specific product is the EWG (Environmental Working Group) Guide to Healthy Cleaning. They’re Especially if you’re in the process of eliminating chemical products from your household. Actually, I love all of the Dr. Bronner’s Castile soaps I’ve tried, including Dr. Bronner’s Peppermint Fair Trade & Organic Castile Liquid Soap and Dr. Bronner’s Tea Tree Fair Trade & Organic Castile Liquid Soap. I personally use the peppermint for my dishes and the scent is invigorating! I use Tea Tree in almost anything else where it’s antibacterial properties are a benefit (like counters, floors, etc). The mild soap is perfect for anything I don’t want to use scents on, or, stuff that can be finicky, like my toddler (yes, I use it in the bath) and my leather couch. I didn’t want to risk putting anything on it that would mess it up. So, here’s what you’ll need to clean your leather couch…. 2 tbsp Dr. Bronner’s Unscented Fair Trade & Organic Castile Liquid Soap (seriously, this bottle will last you forever! First, you’ll need to make the soap solution, to do this, fill your bottle with 2 cups water, then add 2 tbsp castile soap and shake to mix. (2) spray the soap directly onto the leather, like I did and then lightly scrub with a terrycloth or soft brush. Then quickly dry with a rag. 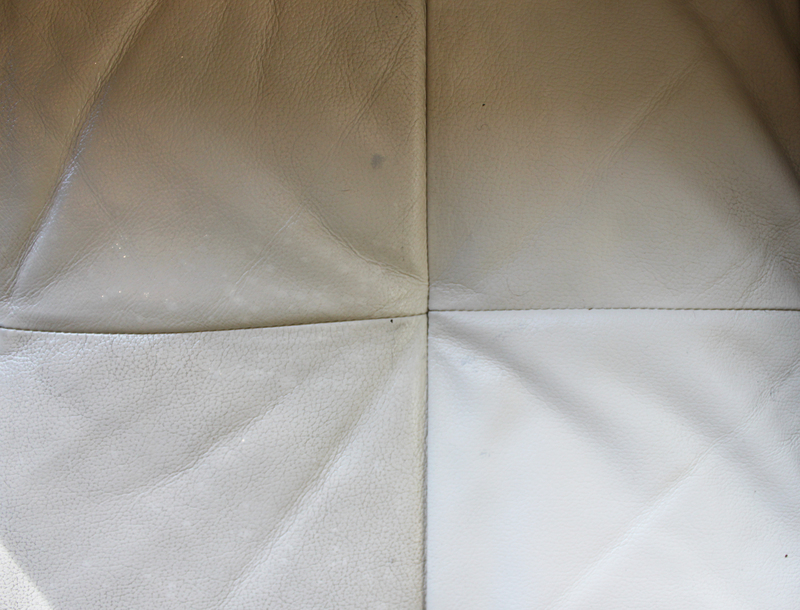 For my couch, I felt comfortable spraying the solution on the leather as long as I worked in small sections so it was dried right away. See the bottom right square? That’s the size of the sections I did (the bottom right has been cleaned). I don’t recommend doing larger sections because it will allow more time for the liquid to saturate the leather. On most of my couch I used a brush; however, there is one section of my couch which has a lot more wear (my husbands favorite spot). In that area, it seemed like some of the waxy coating was worn off and when I started to use a brush on it, it started to flake so I switched to method 1. Spraying the solution directly onto a terrycloth rag and then wiping. Thank you for the article. Castile soap is always on hand at my house. 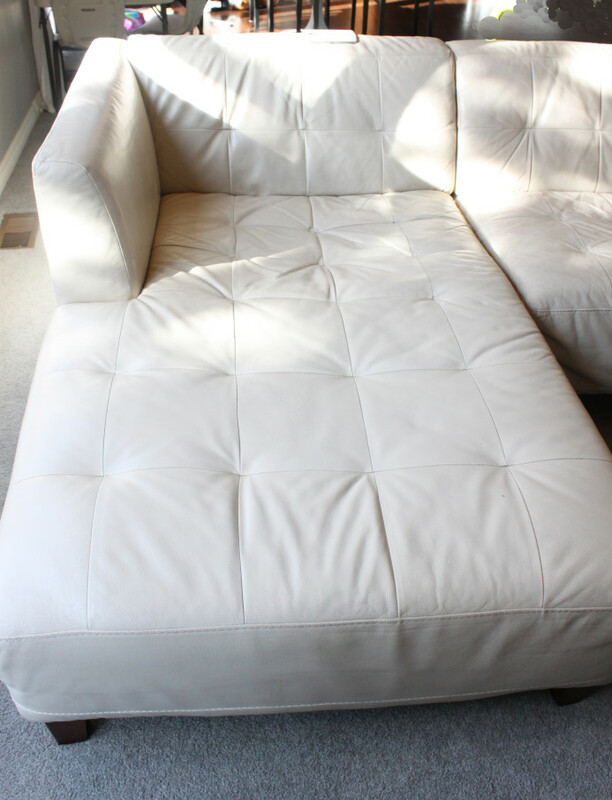 I just had the flu and spent most of my time on our cream leather couch (which in fact I have never cleaned ever) and was glad to find this article since everything needs to be cleaned now. I’m glad! It works great for us! I barely use any other cleaners in the house. After the first major cleaning I’ve started just wiping with Bronners and a rag now, it works great! I did a ton of research for leather couch cleaner/conditioner and was also skeptical of the popular vinegar and olive oil mix for the reasons you mentioned. I always have Dr. Bronner’s Castile soap on hand, so I gave this a try and it is amazing!! My 20 year old couches haven’t looked this good in a decade 🙂 Thanks so much for posting!